Our Standard Shimano 110/4 bcd oval chainrings are designed for new type of Shimano cranks like Dura-Ace 9000, Ultegra 6800, 105- 5800 and others. These are finest shift-able oval chainrings on the market. 50T outer chainring ‰ÛÒ Choose this size if you ride for pleasure or sportive events. This is the most versatile and comfortable size. Both, inner and outer oval chainrings are optimized with smooth shifting in mind. This is why the back of the Absolute Black Oval road chainring does not feature cutouts, like other oval products on the market. Instead, we design smooth angled surfaces, to help chain to slide quickly and precisely between chainrings. Absolute Black outer oval chainrings have 6 up-shifting ramps, for easy and quick gear change, even under load. Each outer chainring also features 12 down-shifting points. Instead of steel shifting pins we use a CNC machined "ramp and recess" solution. Special raised ramps work in conjunction with the tooth recesses to stabilize the chain when shifting. Our oval chainrings DO NOT require any modification to the (standard) front derailleur in order to work properly. First, you need to remove your crank from your bike. Once removed, unscrew the 4 bolts that hold two chainrings together with a T-30 torx key. Remove both original rings. Locate the new oval inner chainring with the triangular timing indicator positioned behind crank arm. 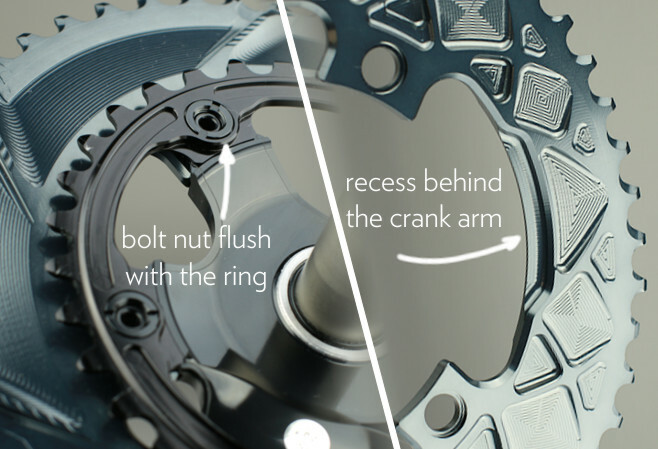 The bolt holes on the small chainring are recessed – so the nut heads will sit flush with the surface of the chainring - these recesses should face you when mounting the bolts. Absolute Black outer chainrings have a specific recess to accommodate the rear edge of the crank arm - position the outer ring to line up that recess with the crank arm. If you are only switching the inner chainring to oval - use the original bolts that came with your crank. If you are switching to a pair of oval rings, you will need a set of regular ‘double’ chainring bolts. Tighten all four bolts with force of about 5-7Nm. Mount your crank back to the bike. You may also need to adjust the front derailleur upwards by 2-3mm.